Our ultimate luxury ski chalet in Chamonix, Chalet Amazon sleeps up to ten guests in five stunning bedrooms, all with en-suite bathrooms. Our flagship ski chalet boasts vast living areas, an outdoor swimming pool, cinema room and a luxury spa fully equipped with hamman steam room, sauna, sunken indoor Jacuzzi, treatment room and outdoor hot tub. 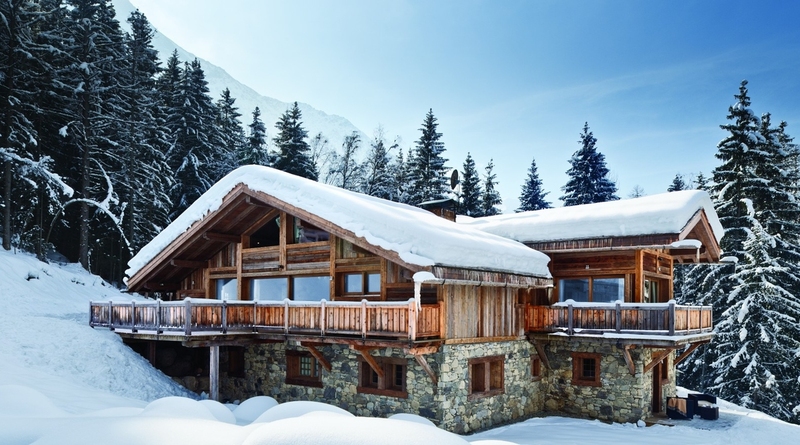 The moment you arrive it will become clear why Chalet Amazon with its breath-taking views of the Aiguille de Midi, is the most luxurious ski chalet in the Mont Blanc Valley. Nestled in woodland next to a mountain stream, our flagship property combines pure luxury with unrivalled tranquillity. Families of deer can often be spotted early in the mornings traipsing across the gardens on their way to work! The wonderful living area is furnished with beautifully soft chocolate leather sofas and trendy zebra armchairs. Original mountain paintings and alpine antiques all ooze charm and help set the scene, with the fantastic open log fireplace, soft lighting and candles to welcome in the evening. The fully-catered chalet has large living and entertaining areas, a cinema and lavish spa with a sunken Jacuzzi, outdoor hot tub, hammam steam room, sauna, and massage room and everything you’d expect from a five-star chalet. The chalet is finished to the highest standards and comes with a highly experienced team to organise all aspects of your stay and take care of any bespoke requests. The chalet can be taken in conjunction with Chalet Baby for groups of 14 or with both Chalet Baby Bear and Chalet Baloo for groups of up to 24 guests. Rates shown are a self-catered basis, a catered option is available and these rates are available upon request.